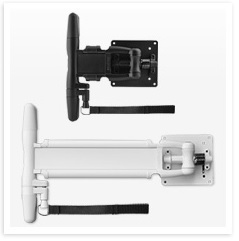 Southco Tilt, Swivel and Swing Display Mount (A Series) is now available with an added feature that allows the arm to be locked into position for easy storage. Designed with a plunger that securely locks the arm into place, the A Series maintains position in extreme conditions where motion or vibration may cause display drift. The locking A Series provides reliability and proven tilt positioning while holding displays securely in place during touchscreen operation, under vibration, or when devices are mounted on uneven surfaces.